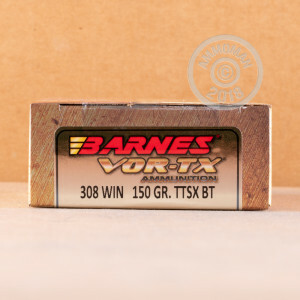 Barnes Ammunition has the reputation of being one of the finest in the world for hunting and range shooting. Their polymer tipped VOR-TX rounds are designed to maximize weight retention, accuracy, with deep and deadly penetration. These rounds are scientifically designed to stop your game dead in it's tracks with terminal expansion and force. From small game to safari-caliber large wild game, Barnes is there to help you bring that winning shot. The VOR-TX bullets are designed with a solid copper design, gaining deeper, bone crushing and meat slicing penetration. These solid copper cores also have greater weight retention than their lead-core cousins. Polymer tips in the hollow point design allow for a more even and rapid expansion. The bullet has multiple grooves along the sides aiding this expansion as well as reducing drag and increasing accuracy. With these attributes, upon impact the nose will peel like a banana into 4 razor edged sections for a quick and humane kill. 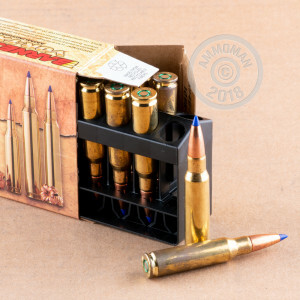 These rounds are brass cased, boxer-primed, non-corroding, and re-loadable. 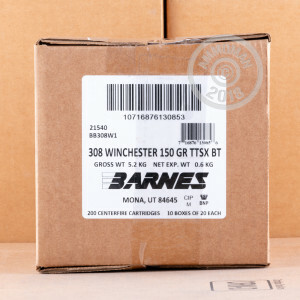 As a bonus all Barnes ammunition is lead-free, making it an environmentally smart hunting choice.